The best damn fantasy hockey guide on the market is now in its 12th year. Released August 1, 2017. Updated frequently throughout the summer! SKU: DHFG 1718. Category: Archived Guides. Updated: Last year the Fantasy Guide was updated 34 times and the Draft List was updated 16 times. This is the only online fantasy service with 12 years of acclaimed Fantasy Hockey Guides. Dobber has contributed to dozens of magazines you've been reading from the newsstand over the past 15 years, including The Hockey News and the Hockey Forecaster. He was the fantasy hockey writer for The Hockey News for 12 years with over 900 articles and he's been doing player projections for nearly 25 years. In the 2016-17 Fantasy Guide, 264 player projections were accurate within five points. ELEVEN consecutive seasons of getting more than 200 player points projections accurate within five points. Updated at least 50 times between August 1st and October 12th. Sometimes several times in a day! Updates are FREE – simply re-download the pdf and you'll have the latest one. A list of updates are conveniently noted in the 'updates' section of the Guide. This is the only fantasy guide that has updated line combinations, projections, injuries and training camp cuts – sometimes 10 minutes after they're announced! Don't go into your draft with a Guide that has news and projections from late July. Dobber's Guide will have you set based on up-to-the-hour news! For seven years, Dobber has added a section for each team breaking down what the latest in advanced statistics tells you about how the coach is using/deploying his players and what it means to a player's fantasy outlook (and to your fantasy squad). Includes 5on5 S% and CorsiRel analysis. But the Guide isn't bogged down with complicated numbers – just the straight projections, with this advanced stats analysis in its own section presented clearly for the layman. Also – a full rookie report, including odds that each will make the team (and yes, the odds get adjusted and updated too), a sleeper chart with odds of the player reaching his sleeper number, a team-by-team analysis of the NHL schedule and how best to use the schedule to your advantage…and of course projections for over 700 players (including Hits and Blocked Shots). The Guide is an Adobe document and the accompanying Draft List is of course a multi-page spreadsheet (use the ones that work best for your league!). 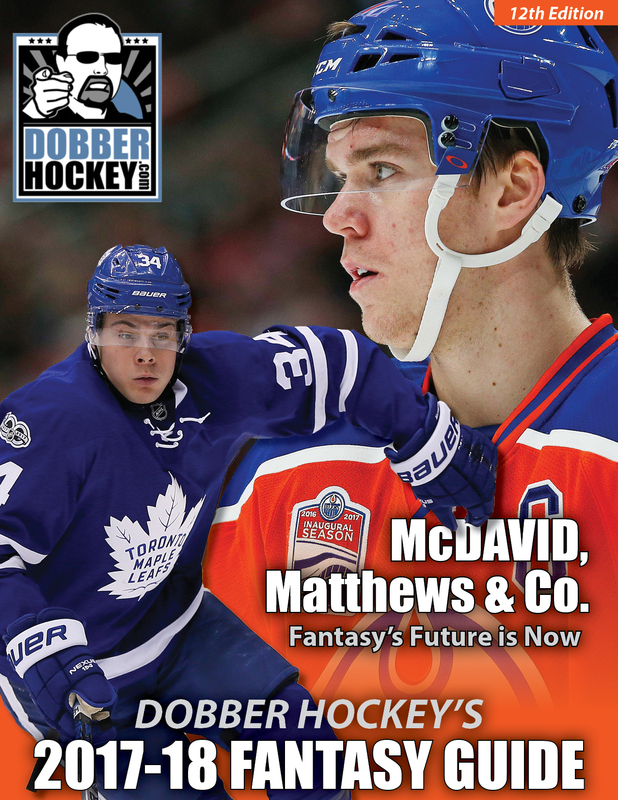 DobberHockey has been exclusive to fantasy hockey for 12 years, with new content every day (including Christmas). You don't want to pick up something from a website that closes shop for the summer and provides zero analysis and rankings between May and August, do you? Hell no. You want product from a group of fantasy diehards who never stop analyzing and breaking down the news – even if it's a minor signing in late July! Remember – a good Guide is more than just projections. You also want to make sure you get all the players too! In 2010 only ONE Guide had Jeff Skinner making Carolina's roster and only ONE Guide had a projection for him: Dobber's. In 2014 only ONE Guide had John Klingberg seeing some games with Dallas and only ONE Guide had a projection for him: Dobber's. Last year, only ONE Guide had a projection for Jake Guentzel and highlighted him as a sleeper for 45 points: Dobber's. Sure would have been nice to get those guys, huh? *Note: all currency is US$, and a 13% tax is added for HST, per Ontario law. Canadians – because of the current exchange rate, we have maintained our pricing for a seventh straight year even though a $2 increase is long overdue. To be fair to Canadians, any future price increase will wait until the currencies are closer to par.